An exceptionally stunning example of Antonio Zatta's 1776 map of the northwestern parts of America and the northeastern parts of Asia. This map is one of the most sought after and decorative 18th century pre-Cook maps of the Pacific Northwest ever issued. Covers the region from the Hudson Bay and the Great Lakes westward as far as Siberia and Japan, north well into the Arctic, and southwards as far as Cabo San Lucas in Baja California. In this stunning map, Zatta, combining almost every 17th and 18th century myth and fact of the American west into a single map, offers up a veritable smorgasbord of speculative geography. The idea of a Northwest Passage linking the Hudson Bay to the Pacific is central to this map. In this Zatta embraces the speculative geography advocated by Nicholas De L'Isle and Phillipe Bauche. De L'Isle and Bauche were supporters of the Northwest Passage theory associated with the apocryphal voyage of the 17th century Admiral de Fonte. The De Fonte legend first appeared in a 1706 English publication entitled 'Memoirs of the Curious.' This short-lived magazine published a previously unknown account by a supposed Spanish Admiral named Bartholomew de Fonte. De Fonte is said to have sailed up the Pacific coast of North America in 1640. On this voyage he apparently discovered a series of gigantic lakes, seas, and rivers heading eastward from the Pacific towards Hudson Bay. The De Fonte story relates how, on one of these great inland lakes, he met with a westward bound ship from Boston that must to have come through the Northwest Passage. Today, based upon inaccuracies and falsities, we know the entire De Fonte article to have been a fabrication, however, it set 18th century afire with speculation that a Northwest Passage must indeed exist. Even such luminaries as Benjamin Franklin wrote long defenses of De Fonte. Our map details De Fonte's route from the Straight of Anian eastward past Lake Velasco, Lake Bello and the 'Lac de Fonte' into another great lake, the Michinipi and hence the Hudson Bay. On the way, De Fonte passes both the Straights of Anian, presumably a misinterpretation of the Strait of Juan de Fuca, and further on, the Kingdom of Anian. Anian or Anian Regnum appeared on maps from the 16th through the early 19th centuries. The idea of Anian was derived from Rasmusio's 1559 edition of Marco Polo's travels which describes 'Ania' or 'Anan' as a Chinese province accessed via a watery straight. Some speculate that this may have referred to the New World, though Polo himself places it somewhere near India. Anian's, first cartographic appearance was only a few years later in a 1562 map by Giacomo Gastaldi. Gastaldi seems to be the man responsible for Anian's presence in the New World. The idea was embraced by other cartographers and intellectuals of the period. John Donne sums the idea up in a poem, 'Anyan if I go west by the North-West passage.' Both the Kingdom of Anian and the Straight of Anian on our Zatta map. Just south of the Strait of Anian, Zatta includes 'Fou-Sang' which he describes as a Chinese Colony. Fusang of Fousang is a region first documented by the Chinese Buddhist missionary Hui Shen in the 5th century. Hui Shen describes a land some 20,000 Chinese Li (c. 8000 km) east of the China coast. Fousang is described in considerable detail in the 7th century Book of Liang by Yao Silian. There are also accounts that the land was settled c. 220 BC by a Chinese Emperor of the Han Dynasty. In later days Fusang was commonly used in Chinese poetry to designate Japan, however earlier references keep it distinct. In any case, Hui Shen's description of Fusang with regard to distance and geography, corresponds more with the coastlands of North America than with Japan. The French historian Joseph de Guignes in his 1761article 'Le Fou-Sang des Chinois est-il l'Amérique? ' promoted this idea. Cartographers of the era, including Zatta, embraced the idea and it was included in many subsequent maps of the region. Traveling eastward from the colony of Fu-sang Zatta has us following the apocryphal River of the West. This river, based upon a misinterpretation of the Mississippi as described by the indigenous American Indians of the Great Lakes region, started appearing on maps as early as the Bellin map of 1743 and remained well into the early 19th century. Zatta maps the River of the West as flowing almost directly westward from L. Salso, near the city of Moozemlek in the lank of the Tahuglauks. While this is clearly a reference to the Great Salt Lake, we find it fascinating that Zatta is able to map it in the same year that it supposedly entered western literature as Lake Timpanagos. Silvestre Vélez de Escalante was a Franciscan Mission who identified the Great Salt Lake in 1776 from indigenous accounts. Since there is no way Zatta could have been familiar with Escalante's account, we can only assume that the reference came from an earlier text. In this case, it must have been that of the French explorer Baron de Lahontan. Lahontan's explorations are highly criticized as near or total fabrications, however, his work did have a significant impact on the cartography of the region. Lahontan's wonderful narrative, 'Nouveaux Voyages de M. le Baron de Lahontan,' describes his voyage westward from the Great Lakes along the Wabush to the Mississippi. From the Mississippi he continues almost directly westward along a river he calls the 'Longue' or 'Morte' which possibly represents one of the greater Mississippi tributaries. Lahontan offers a detailed map to accompany his account showing this river - which our map shows running just to the east of the L. Salso as the 'F. Longo.' In Lahontan's own map he divides the 'Long River' between areas that he has personally explored and regions that he has mapped from Native American descriptions. It is from these same American Indian groups that Lahontan heard tales of the Salt Lake that he describes in his narrative and that appears in our Zatta map. Travelling south of the Chinese colony of Fu-sang we come across the legendary Kingdom of Quivira. Quivira, along with Cibola, was one of the Seven Cities of Gold from Spanish folklore. The story beings in 1150 when Merida, Spain, was conquered by Moors . The city's seven bishops fled the city taking with them much of the cities riches. Legend told that they each founded a great city in a far away unknown land. With the discovery of the New World and the fabulous riches plundered by Cortez and Pizarro, the Seven Cities became associated with New World legends. Coronado, hearing tales of the rich Aztec homeland of Azatlan somewhere to the north believed he was hunting for Quivira in what is today the American southwest. The Venetian cartographer Zaltieri, reading Coronado's accounts, moved Quivira further north, near Anian, where Zatta places it and where it remained for several hundred years. Just south of the Salt Lake we find the region of Teguayo or Tolm. Teguayo was also associated with the Seven Cities of gold and the 16th century explorations of Coronado. It most older maps Teguayo is associated with a large lake, sometimes saline, that was briefly mentioned in the journals of the Coronado expedition. While in older maps the name appears sparingly and in various formats, sometimes a lake, sometimes a river, sometimes a city, sometimes a land, it was generally forgotten until the outlaw governor of New Spain, Diego de Penalosa, discovered references to in the famous 'Benevides Memorial.' Father Benavides was a Franciscan missionary active in New Mexico in the early 17th century. Benavides was eager to attract royal support for his evangelization projects and consequently wrote a stunning report of the wealth of the regions of Quivira and Teguayo. It was probably Benavides that first connected the two lands, but following his public embarrassment and loss of status as New Mexico Governor, Penalosa fled to England and France. There he used the Benavides Memorial to promote a scheme of revenge against the Spanish crown. Penalosa attempted to convince the monarch of France and England to invade part of New Spain in order to conquer a vast new Kingdom called Teguayo. Though the plan never bore fruit, Teguayo was consistently present on maps well into the 19th century. There is also much of interest on the opposite side of the map, in Asia. Here the discoveries of Vitus Bering are much in evidence. The coast of Asia is remarkably well mapped. Numerous small islands are noted between Siberia and the American northwest, which we can only assume to be a primitive attempt at rendering the visually deceptive Aleutian Islands. Zatta shows the Bering Strait with a rough approximation of accuracy, though he relegates the American side of the Strait to an island in deference to the De Fonte legend. Further south, near the edge of the map, Zatta notes the Island di Gama. Gama or Gamaland was supposedly discovered in the 17th century by a mysterious figure known as Jean de Gama. Various subsequent navigators claim to have seen this land, but it was left to Bering to finally debunk the myth. In 1729, he sailed for three days looking for Juan de Gama land but never found it. Gama remained on maps for about 50 years following Bering's explorations until the explorations of Cook confirmed the Bering findings. In the lower left quadrant there is an elaborate title cartouche depicting several animals supposedly to be found in the New World . Zatta includes an alligator, an elephant, a hippo-like creature which could well be meant to represent a buffalo or for that matter an anteater, and a bird-beast which is probably a turkey. In the distances a sailing ship plies the waters. All in all this is an extraordinary example of a hard to find, fascinating, and visually magnificent map of the Pacific Northwest. Zatta, A., Atlante novissimo, (Venice) 1776. Very good condition. Minor discoloration in margins to right of printed image. Original centerfold. Blank on verso. 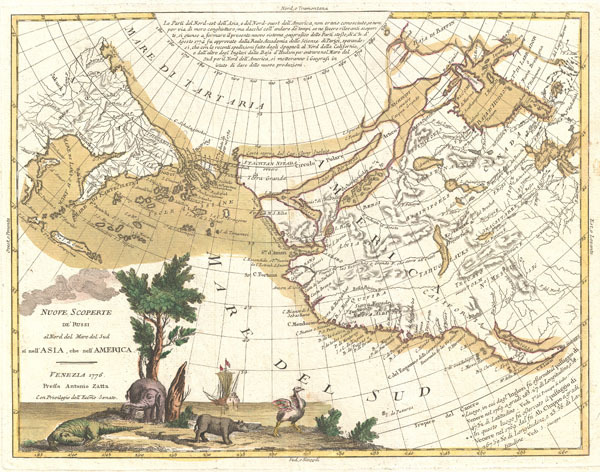 Portinaro, Pierluigi and Knirsch, Franco, The Cartography of North America 1500 - 1800, pl. CXXXIV. Wheat, C. I., Mapping of the Transmississippi West, 1540-1861, 167. Wagner, H. R., The Cartography of the Northwest Coast of America to the Year 1800, 654. Campbell, T. Early Maps, pl. 21. Armstrong, J. C. W., From Sea unto Sea: Art & Discovery Map of Canada, #32. Lowery, W., The Lower Collection: A Descriptive ListofMaps of the Spanish Possessions within the Present Limits of the United States, 1502-1820., 584. Phillips (Atlases) 650 Vol 1, No. 15 or 652 Vol. 4, No. 42. Kershaw, K. A., Early Printed Maps of Canada, 1223.